The $665,000 grant for "Building a Foundation for New Farmers: Training, Resources, and Networks" was announced today by Congressman Sam Farr, D-Carmel, and UC Santa Cruz Chancellor George Blumenthal. 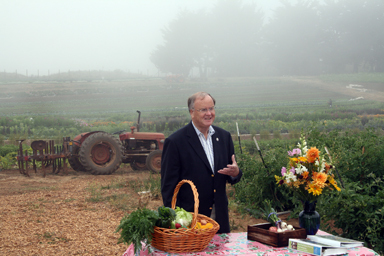 Congressman Farr, who has championed organic agriculture on the Central Coast for more than 25 years, said the grant "recognizes the innovation in organic farming at UC Santa Cruz and the Central Coast. "The Central Coast of California is the capital of organic agriculture," said Farr who co-chairs the House Organic Caucus and is the ranking member of the House Appropriations Subcommittee on Agriculture. Farr co-sponsored the language that founded the Beginning Ranchers and Farmers Program in the 2008 Farm Bill. Chancellor Blumenthal said: "Our model is based on a combination of research, hands-on training, and collaboration with Central Coast growers. This grant expands that model and will extend our reach. The USDA is an active supporter of our work, and we're grateful to have Sam Farr's leadership in Congress." CASFS Executive Director Daniel Press said the grant from the USDA's National Institute for Food and Agriculture will support CASFS in its effort to expand its pioneering apprenticeship program to train more beginning farmers with an emphasis on increasing access for apprentices with limited financial resources. "We are tremendously grateful for the support and trust this USDA grant represents," Press said. "With it, CASFS demonstrates how Americans can recruit and train a new generation of farmers for the 21st century. Through programs like ours, these new farmers will be more diverse – ethnically and economically – than before. They will also learn and use some of the most sustainable and innovative agricultural practices on Earth." Three other sustainable agriculture organizations on the Central Coast – all longtime partners with CASFS – are collaborating on the project: the Ecological Farming Association (EFA), the Community Alliance with Family Farmers (CAFF), and the California Certified Organic Farmers (CCOF). The funds will support the CASFS Apprenticeship and advanced apprenticeship training, scholarships for the beginning and advanced programs, and a revision and expansion of farmer training manuals that CASFS has developed. CASFS will revise its widely used production and marketing manuals, making them available nationwide online for free and at-cost in print. The four partners will work with other collaborators and beginning farmers – defined as being in the first 10 years of the business – to develop a Beginning Farmer Network (BFN) in the counties of Santa Cruz, San Mateo, Santa Clara, Monterey, and San Benito. The network will coordinate existing programs and develop new opportunities for the Central Coast’s beginning farmers to receive ongoing marketing and production training through workshops, field days, conferences, and both direct and online mentoring and technical assistance. The partners will also document this model of supporting beginning farmers to share with other organizations nationwide. CASFS has received additional support for the three-year effort to revise and expand its organic farmer training manuals, and to disseminate them online and in print with tailored trainings for agriculture educators in their use. • True North Foundation: $15,000 to support revision of Direct Marketing and Small Farm Viability: Resources for Instructors curriculum in 2012–2013, along with training apprentices in Community Supported Agriculture (CSA) production, administration, and outreach skills. For 45 years, apprentices at UCSC have learned techniques in small- and medium-sized sustainable organic farming. Known as the Apprenticeship in Ecological Horticulture since 1975, the program has graduated more than 1,400 apprentices who have taken their training to start farms, farmers' markets, and other organic gardening training programs across the nation and globe.